Have Velvet Revolver finally found their new singer? Can we get this Scott dude out of the picture? 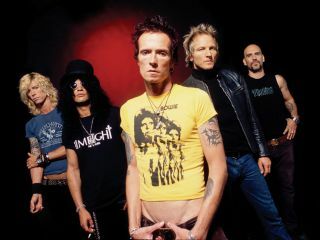 Just when it looked as though Velvet Revolver could bite the dust - they'd split from their label, they were singerless, Slash is working on a solo album - word comes that the band may have found a frontman to replace Scott Weiland. According to Classic Rock, Velvet Revolver is looking to recruit an Irish vocalist named Phil Conalane from the band Million Dollar Reload. Oddly enough, Conalane was apparently recommended to Velvet Revolver by ex-Guns N' Roses drummer Steven Adler (who has been saying in recent weeks that he is hoping for a full GN'R reunion tour). Colalane was also given the thumbs up by Stone Gods, the band formed from the remains of The Darkness. Stone Gods reportedly tried to recruit Conalane themselves when Justin Hawkins left The Darkness. Classic Rock's source, who claims to be in contact with an insider at Velvet Revolver's management, calls it "a surprising choice. Phil is experienced but relatively unknown on the international stage, which would fit Velvet Revolver's bill of fresh blood as they try to rebuild their career following the disappointing sales of their last album, Libertad, and the GN'R return that has left them reeling. "Phil is also well known as a good songwriter," says the source, "something that scuppered Velvet Revolver's plans when previously they tried to bring in the less-than-prolific Josh Todd of Buckcherry." The source also states that at the recent Classic Rock Awards in London, "Slash was seen talking to Phil's record company representative for quite a while." While MusicRadar awaits a definitive word from Velvet Revolver's management, take a look at Phil Conalane singing with Million Dollar Reload. What do you think?